We have a big addiction problem in our industry. Hacktics, the tips, tricks, hacks, tools, and secrets that promise to solve our growth problems. A glance at the front page of GrowthHackers.com, Inbound.org, or any other growth hacking community is all it takes to understand the obsession. As a result, marketers now get the majority of their “learning” through this hack-tic based content. As addictive as they are, prescription-based tactics and tools won’t solve your problem, and most importantly, help you become an elite marketer. Most real world work involves a problem that doesn’t have an answer yet, and the biggest growth opportunities are in uncharted territories. More specifically, you don’t figure out the answer by just plugging in the answers that have worked for others in the past. Instead, the biggest upside lies in solving problems that likely didn’t exist before. As we emphasize continuously in Reforge, becoming an elite growth marketer has nothing to do with the specific hammer in your toolkit and everything to do with mastering the emerging skills, frameworks, and thought processes that enable you to solve new problems, repeatedly. So that begs the question, how do you do this? It is such a popular question that it was asked on Inbound. I hate to say it, but 100% of people who took the poll got it wrong. Partly because the question presents two false choices. Some of the commenters started to get it right by saying that you should “Shape yourself like a T.” But what does that actually mean? “During the class, each student played a portion of his or her selected virtuosic piece. They played wonderfully. Tony then gave very easy warm-up exercise that any beginning trumpet player might be given. They played the handful of simple notes, which sounded childish compared to the dramatically fast, high notes from the earlier, more sophisticated pieces. After they played the simple phrase, Tony, for the first time during the lesson, picked up the trumpet. He played that same phrase, but when he played it, it was not childish. It was exquisite. Each note was a rich, delightful sound. The students’ attempts did not come close— the contrast was astounding." The point of the story is that the difference between the master and student happened at the level of fundamentals. The fundamentals are the foundation that everything else builds upon. Another analogy would be in sports. What separates someone like Lebron James from average professional basketball player (physical advantages aside) are not his abilities to dunk or complete alley oops. Lebron simply knows how to dribble, pass, and shoot a jump shot, better. The fundamentals. The fundamentals help you solve the variety of growth problems you will face in your specific situation. The better you are the fundamentals, the harder the problems you will be able to solve. The fundamentals for growth are not Search, Facebook Ads, Content, Email marketing etc. It also has nothing to do with a set of tools. Data Analysis - Understanding the meaning of data to identify, understand, and pinpoint new ideas and solutions. Quantitative Modeling - Translating your historical data into a forward looking model to simulate the future which helps you understand better what you should be doing today. User Psychology - The data doesn’t matter unless you know how to influence the numbers in an authentic way. That comes down to understanding the psychology of your audience, problem, and solution to figure out what your users respond to. Storytelling - You can be the best at quant modeling, analyzing data, and understanding the psychology, but to be the best growth professional you need to know how to bring those things to life in a way that is compelling and interesting to your target audience. This is storytelling. Everything else like Copywriting, Conversion optimization, Facebook Ads, Social Media etc build off the foundation of these four things. Learn Growth, No Fluff. One Email Per Post. Don’t underestimate how much time you need to be spending on the fundamentals. Reading Cialdini’s “Influence” doesn’t mean you know User Psychology. Your learning on the fundamentals never ends. It is continual process of mastery. Every time I’ve hired for a role I inevitably get a swarm of applications with a couple years of experience that say they “know” CRO, Traditional marketing, Facebook Ads, Content Marketing and some other combination of 5 + things. The applicants claim they are generalists, and they’re proud of it. Sounds great on paper, but as soon as I dig in I typically find they are ok at a lot of things, but amazing at nothing. Being “ok” at a variety of things, is far less valuable than being amazing at one. Anyone can learn the surface layer of a subject. But going deep requires you to solve problems where the answer isn’t in some hacktics blog post. You never experience this as a generalist. The best way to get better at solving problems, is by solving more problems so in the process you actually build the skills that will enable you to go deep on something else. When I hire, I will take someone who has become amazing at one thing over a generalist any day of the week because if they got great at one thing, the probability of them becoming great at another is a lot higher. “I better be really sure." One, the only way to find out the answers to those questions is through action. You aren’t going to think your way to those answers. You need to dive in and spend enough time on it to give yourself an opportunity to fight through a hard problem. Two, this isn’t a 10 year commitment. If you really focus you can go deep on something in a year or two. If you end up not liking that area, it’s not a waste. The process of going deep on one thing is itself a skill that makes it easier to go deep on another. A large input into how you learn are the projects you work on in your organization. That means you should choose projects wisely. How do you make decisions of what projects to work on in the organization? Some people choose projects based on if they were the easiest, the most fun, the most creative, the most technically difficult, etc. If you want to optimize for learning and career trajectory, you’ll need to take a different approach. While most people will position themselves in one of the three blue quadrants, you want to position yourself in the green quadrant -- getting into the projects that have high organizational impact and are unpopular to everyone else. Why? You learn a lot simply because the more challenging a project is the more you tend to learn. Messy projects require a deeper level of understanding to untangle whatever the mess is. You instantly become an expert on something that is high impact in the org. You put yourself at the center in focus. These types of projects tend to have high visibility in an organization. You are seen as a leader/savior because you are tackling something no one else wanted to touch. Everyone wants these types of people on their team. The combination of those two things leads to faster trajectory. If you successfully solve one hard problem, people will come to you with more. Opportunities will start flowing to you rather than you having to seek them out. Learn About Growth. No Fluff. One Email Per Post. My first job out of college was as a Product Manager at ZoomInfo. By all measures I was a terrible employee when I started. I entered into a situation where 90%+ of what I was suppose to work on were things I knew nothing about and as a result I struggled to make progress on anything. My manager at the time quickly recognized this, and we had a long honest conversation about what I was comfortable with and what I wasn’t. From there, he helped reshape the project so that a larger percent was based on things I knew and was comfortable with while make sure a chunk was still new to me. That was a turning point for me. After that, I not only learned much faster but delivered much better results. 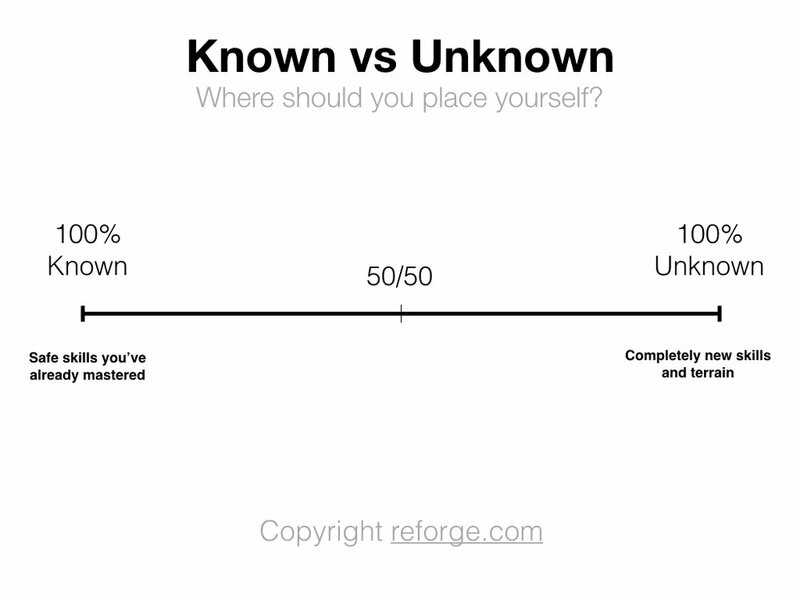 If you want to maximize learning you need a foot in the known and a foot in the unknown. Whatever you are working on, a certain percentage of the work are things you already know, and a certain percentage are things you don’t know and have never worked on. You don’t want to be too far in the known. When everything is known you aren’t continually learning and over a long period of time you become obsolete as the industry moves around you. The challenge is that it’s easy to fall too far into the known because it feels easy, comfortable, and efficient or you start to get bored which leads to unhappiness. Being too far in the unknown also has its problems. It is easy to get overwhelmed and not know where to start, making it impossible to make progress. I often hear that you should jump into something with both feet if you want to learn. But studies have shown that the most effective learners learn by relating the new with the known. In reality there is no perfect 50/50. What you want to shoot for is the range in the middle. 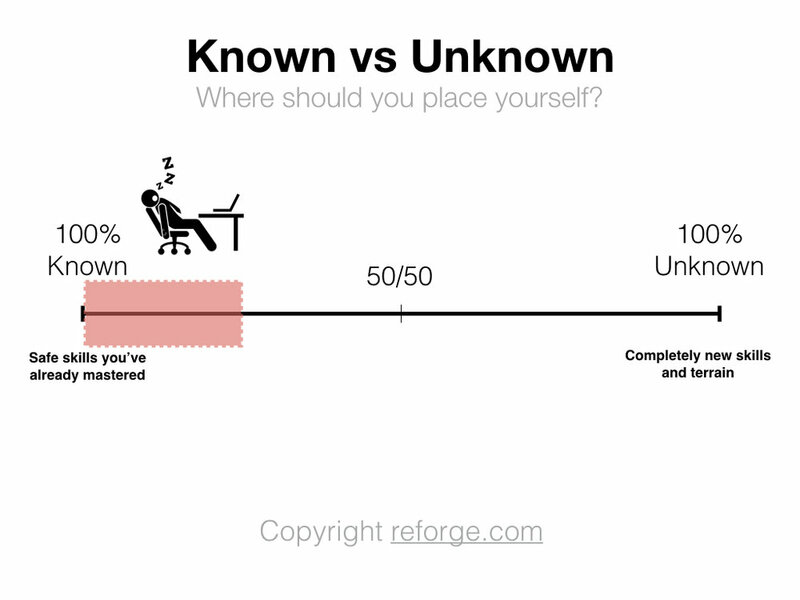 Sometimes you might be 70% in the known, and 30% in the unknown. Sometimes the reverse. Your goal is to recognize the signs when you are one of the ends of the spectrum and figure out a way to work yourself back to the middle. I went to the University of Michigan for my undergraduate degree. While I enjoyed my college days I look back now and realize that it was an extremely unfulfilling experience. Part of why it was so unfulfilling was that I made sure half of my classes were easy to make sure my GPA was high. I thought the GPA and degree credential were super important. I realize now how stupid that was, yet the dominant thinking today hasn’t changed: the Credential is what matters. As Google itself has discovered, credentials have little to no correlation to being successful in a role and a highly productive professional. The company that was famous for hiring exclusively from the “Ivy Plus” has now removed it from their screening criteria. The internet makes our actual work more transparent, easier for us to display, and easier for others to check out. There’s Github for developers, Medium, Slideshare (and other sites) for business people, Dribbble for designers, and so on. It is no longer about credentials. It is about creating good work and then finding a way to show it off (see Build A Platform section). Yet, instead of showing off work on LinkedIn I see professionals adding lists of certificates and credentials. However, as an employer, I could care less that you took a course and passed some test. I want to see if you can actually apply it. Focus on accomplishments, not credentials. Each year for the past 7 years I’ve taken a couple days in December to reflect on the past year. One of the questions I ask myself is “What are the 20% of activities that led to 80% of value creation?” There is only one thing that has been on that list all 7 years. Writing on my blog. Funny thing is that I don’t even write that often, yet it is still on the list every year. Every professional opportunity that I’ve had has come from my blog. I got my first job at ZoomInfo because my hiring manager read my blog. I got my first round of VC funding for Viximo because the VC’s knew me through my blog. I met the VC’s of Boundless through my blog. A huge reason I got hired at HubSpot was because of my blog. The only reason I’m in a position to start Reforge is once again because of my blog. I’m not saying you must write a blog, but you should invest in building a platform for yourself that you own. The platform could be a blog, speaking gigs, videos, images etc. Your platform gives you an opportunity to show off your hard work, creations, and thoughts (which is very different from showing off credentials). Opportunities Flow To You. When you distribute your hard work, people take notice and the opportunities flow to you. You Create Leverage. Because opportunities flow to you, you end up gaining leverage. It is a much stronger position to be in the seat of being sold to versus being the one that is selling. You Build a Personal Brand. It is no secret that companies with strong brands hold a number of powerful advantages in their market. The same holds true when thinking about your personal brand. Everyone isn’t a great writer, but that doesn’t mean you can’t build a platform. The medium that fits you could be video, podcasts, visual portfolio site, presentations, speaking, or something else. The tools are out there to make any of these mediums easy (and it is getting easier) so you don’t really have any excuses. You’ve probably heard the a advice to get a coach 100 times, yet, so few do it. The truth is, finding a great coach is incredibly difficult. It is something that you have to search for and work at for a long time. But when you find the right person, the relationship can last for years. More important you need to understand what the value of a coach is. The biggest misconception is that you need a coach in order to do good work. It’s actually the opposite -- you do good work first, which gives you the opportunity to find a good coach. I use the term coach vs mentor (or something else) on purpose. Any professional sports player’s coach can’t dribble the ball for them and make in game decisions. That is up to the player. Similarly, a business or career coach doesn’t make decisions for you or provide the answers. Instead you want to find a coach that helps facilitate a better answer than one you would get to on your own. Unbiased Opinion. Everyone around you (family, friends, employees, co-founders, investors) have their own personal biases pulling you in different directions because they all have a personal stake in the outcome in some way shape or form. The value of a coach is someone who can offer an unbiased perspective because they don’t have a stake in the outcome. The Right Questions. Great questions lead to great answers. A great coach will ask you questions that you wouldn’t ask yourself. In the process helping you look at a problem in a different way or reveal some information you wouldn’t have otherwise. If you do the above things, you will likely have a lot of opportunities that flow your way. This creates a new issue: Reacting to things that come your way rather than being proactive about what you want. Being reactive almost always creates sub-optimal outcomes. It is hard to say no or evaluate opportunities in an unbiased way if you don’t have some pre-set criteria or filter. Being proactive rather than reactive is my usual advice, but as I’ve watched others try to put this into action I’ve noticed a couple of common issues. The proactive mindset forces you to ask yourself about what you really want. Understanding the answer to that question seems easy on the surface, but for many is actually pretty difficult. The answer is simpler than we think. Like the other important problems / questions, “What do I really want?” is something you can’t think or theorize your way out of. You need to act. Rather than feeling like you need to think your way to a confident answer, treat it like experiments. If the results are positive, keep going. If the results are bad, then stop and feed those learnings back into your next set of hypotheses in a series of iterations. As we emphasize in Reforge and on our own growth teams and players, learning the growth marketing process is also learning problem solving. The best “rules” aren’t shortcuts but a long term investment in integrating the principles of mastery into your career.